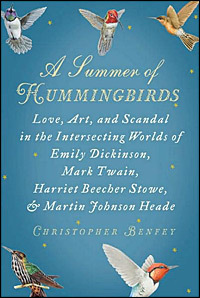 As I explore the work of Emily Dickinson, I came across a new book, A Summer of Hummingbirds: Love, Art, and Scandal in the Intersecting Worlds of Emily Dickinson, Mark Twain, Harriet Beecher Stowe, and Martin Johnson Heade by Christopher Benfey. I am always fascinated when I find new connections between people, places, and things. Using the hummingbird to connect the lives of the writers and artists mentioned in the title, the book also evokes the time of change and possibility during and after the Civil War. These gifted men and women felt themselves distinctly different in taste and temperament from the pre-Civil War world in which they had come of age. In one sense they had lost their bearings; the rigid old arrangements were gone with the wind. But with these losses came a counterbalancing opening of possibility.... We can see in their paintings and poems, in their love of nature and music, a poignant effort to find a redemptive order amid traumatic circumstances. Adrift in a new world of often devastating change, they found meaning in the shifting light on a river at dawn, or the evanescent flash of a hummingbird's flight. There was also a local connection as the painter Martin Johnson Heade spent time here in Newburyport. The Quaker poet John Greenleaf Whittier who spent most of his life in neighboring Amesbury also has a part in the story. The book ends in the twentieth century when scholar Jay Leyda sorted through Emily Dickinson's manuscripts for an edition of her poems which was published in 1955. Some of her poems combined visual elements such as a poem about a bird which was written on two parts of an envelope pinned together to look like a bird. Jay Leyda began an exchange with the artist Joseph Cornell who already had a fascination with Emily Dickinson. An ekprasis poem for a Joseph Cornell box that was an ekphrasis box for Emiliy Dickinson.